This is an instructable for a bluetooth controlled Message Droid. I call it R2Blue2. It moves around and displays messages that you type using your phone or computer. Atleast it was supposed to. Due to many problems such as underpowered batteries and bad cable management I wasn't able to extract the performance necessary. I will explain the problems that plagued this build later. The messages are sent over a bluetooth connection between the sender and the bot. For my usage, I used a HTC WIldfire running the Blueterm application to send serial commands to bot. The bluetooth module I used on the bot is Bluesmirf Gold which has a default baud rate as 115200. I don't have an FTDI cable to change the baud rate. The baud rate setting shouldn't matter much but whatever is the baud rate of the module, you should set up a serial port of the same baud rate in the arduino code. Otherwise you'll get undefined states and the bot won't function as wanted < imagine R2D2 scream >. If you can procure a Arduino shield kit, things will be much easier and more reliable as the present connections to the arduino are not very tight. In India, a shield board is quite expensive and I couldn't find it any where I searched. (if you are from Bangalore and are an electronics geek, you should be familiar with SP Road :P). total cost is about 80 to 100 dollars. The bluesmirf is the most expensive part at 60 dollars. the arduino and the bread board. diagram to find the pin functions. The bluesmirf was connected using birch strip pins on both ends to make it easily removable for transport and safe keeping. While connecting the bluesmirf, the RX pin should go to the TX pin (pin 1) of the arduino and the TX pin should go to the RX pin (pin 0) of the arduino. This is very important so make sure your connections are correct. The GND and Vcc go to their respective pins. For this project, I've used pins 0 and 1 for communication (as always), pins 2 to 7 for connecting to the LCD, and pins 8 to 11 for connecting to the motor. I used a 9V battery to power it when not connected to the computer, but for testing purposes I used a wall wart with a USB out. I connected all the components to the bread board and used it as an intermediary for connecting it to the arduino. I used a separate 9V battery for the motor power supply. I used an old plastic box meant for sweets to house the arduino and the breadboard. I cut small holes in the lid to allow the ribbon cable for the LCD, the connector for the bluemsirf, and the wires to the motors go out. I used a rectangular piece of wood to hold the motors and attach it to the base of the box. I wanted to mount the LCD high by using some ice cream sticks, rubber bands and a stationary clip but the lid wasn't stable enough. I used some ice cream sticks for balancing the bot cause i didn't have any castor wheels. 1. The batteries were not powerful enough, all the pics where the lcd is bright were taken using a USB wall wart. And the wheels barely used to turn when in movement mode. 2. The cable management was not clean so qt every stage I had to keep checking whether any wires had come off. And if they had come off, it was very difficult for my fingers to go through the maze of wires to reconnect the loose wires. 3.The Housing I had chosen was very small and fitting all the components with enough space for arrangement was very difficult. 1.Get a bunch of AA rechargeable batteries and use a 6 pack of them. That should be enough for movement at a relatively controllable speed. These motors were rated for 9V so using lower rated motors could help increase the speed. 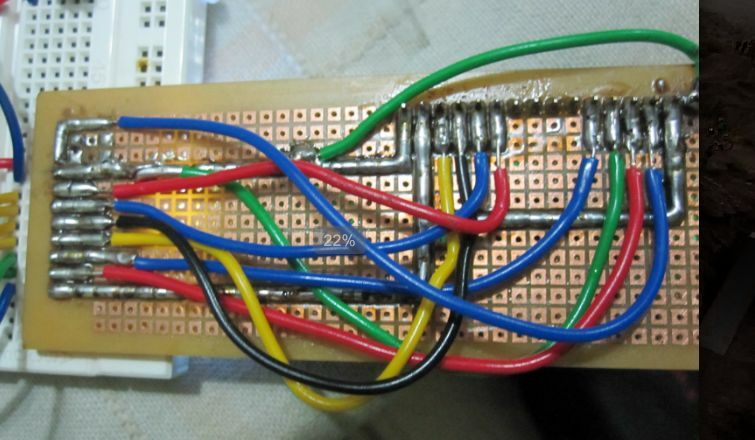 2.Get an arduino shield kit and connect all loose wires to the shield. Since the shield fits snugly on an arduino, no wires will come loose during any stage. 3.Get a bigger box or leave all the components out in the open instead of stuffing them into the box. That messes up the chances of the components working properly cause the stresses on the wires can loosen the wires from their original location. So if you've done everything correctly, you should be able to use the following commands to control your bot. It can be controlled as i said before by using any computer or phone running a terminal program which can communicate over bluetooth. took me 3 days to do this. If you have better equipment and a shield kit, it should take even lesser. Basically, it was a lot of fun. I would like to thank my parents for running around with me when I ran out of parts and I had to go buy them when it was raining cats and dogs. Without them I would have been stuck with a fried LCD and wouldn't have been able to finish this. I don't have many pictures as I started the instructable after I had almost finished the bot. Any queries? Please comment. And I'm entering this in the Microcontrollers and Making Stuff Move contests. I promise that if I win in either of them, I will churn out much better projects and improve this one to make it work perfectly (that robot kit they are giving for the Microcontroller contest is perfect for this :D and a Bus Pirate will be an excellent addition to my non existent set of equipment).So please vote for me if you like my Instructable!!!! Hi Varun, what is the range that you get with the Bluetooth Module? Sorry i took so long, haven't been to instructables in a while........ i have tested it with a range of 10 metres.......... but sparkfun says it gives a range of 90m!! Have a look at my ibles as well!